Oatmeal is definitely my favorite breakfast. It's delicious, easy to make and it fills you up. It's also really healthy. All the toppings are just suggestions, you can top your oatmeal with whatever your heart desires. So let's get started. If you try it out please let me know! Pour the plant-based milk of your choice into a pan with the oats. Put it on medium until it just starts to boil, then turn it down and let it simmer with the lid on. Make sure to keep an eye on it. Stir it in-between and let it simmer until it's nice, thick and creamy. Put your oatmeal into your bowl and top it with whatever you want. 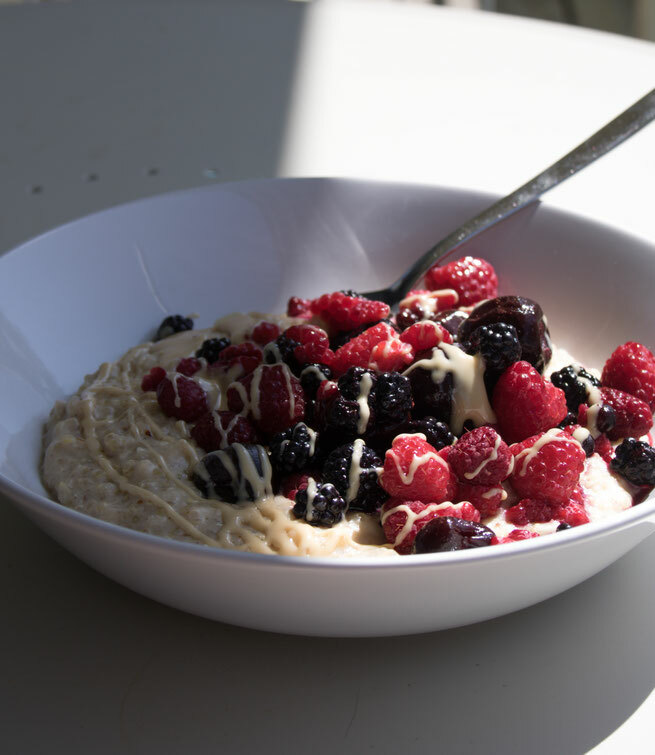 I recommend warm berries, you can use frozen berries, they will melt on your warm Oatmeal. If you like it a bit sweeter then you can simply use dates and bananas. Then sprinkle with pumpkin spice or cinnamon, drizzle almond butter over the top. Une bonne portion pour le petit dejeuner! Looks delicious. I am going to try it tomorrow for sure! !